The Guardian reports that “Seventies icon Leo Sayer is hip again”, and according to the Sunday Times Style Magazine, even Keith Flint from The Prodigy is a fan. Gary Barlow says, “Leo was my reason for getting into show business. The man’s a god.”, and The Sun reports that “the legend has been reinstated for a whole new generation”. Leo’s been earning cult appeal and credibility amongst a new young fan-base as a result of a succession of low-key charismatic live appearances. Confirmation of his status as an icon of contemporary cool came as he was guest on “Shooting Stars”, following a series of sell out performances at the Cafe Royal. 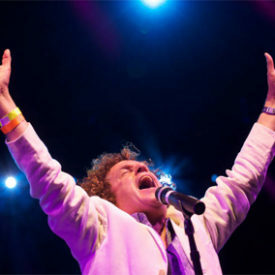 The re-discovery of Leo Sayer as a pop icon stems from his series of recent sell-out shows at the Cafe Royal in London. His live set catapulted Leo back centre stage and has created a full scale campaign (as featured in The Sun newspaper) for the return of this legend. Leo has recorded six top ten albums and a string of top ten singles, including two world-wide number ones; he won a Grammy for “You Make Me Feel Like Dancing”, he’s had his own BBC series, he’s written extensively for other artists and he’s toured the world from Australia to New Zealand, The Far East, the Middle East, The USA and Canada. In addition to his Grammy win, the list of classic Leo Sayer hits includes “One Man Band”, “Long Tall Glasses”, “The Show Must Go On”, “When I Need You”, “Moonlighting” and “More Than I Can Say”. Leo Sayer started out as an art student, illustrator, busier and blues harmonica player. He was spotted by talent scout Dave Courtney in Shoreham by Sea, playing in a band called Patches and was then taken on by Adam Faith who secured him an international deal with Chrysalis and Warner Brothers in the US. 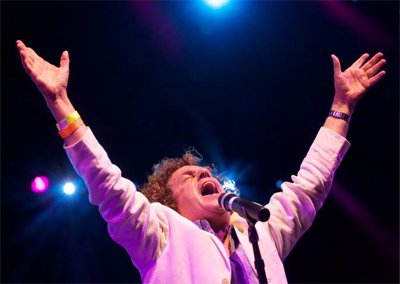 The rest is history… and the story continues into 2000 as Leo Sayer – hip credibility firmly acknowledged and reinstated – heads out to deliver more of that live dynamism which has made him a legend.